According to the Israel Innovation Authority, some 500 companies in Israel are currently engaged in smart transportation fields, such as ride sharing, connected cars, electric vehicles and autonomous driving systems. The Israeli smart mobility sector reached $22 billion over the last five years, according to a report by Roland Berger. 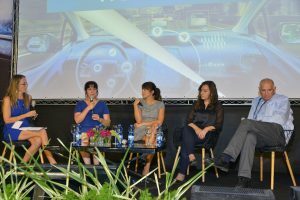 “The technological and social challenges of automotive disruption have created a great opportunity for the entire industry,” Rutie Adar, head of Samsung Strategy and Innovation Center in Israel, said on stage during the panel “Autonomous Tech – from Investors Viewpoint”. Rutie was joined by Anat Bonshtien, Chairman and Director, Fuel Choices & Smart Mobility Initiative, Prime Minister’s Office; Michal Vakrat Wolkin, Head of Israel Office, Lear Corporation; Danielle Holtz, Director of business development, Maniv Mobility; and Yahal Zilka, managing partner, Magma Ventures. According to Adar, in order to sell to the automotive OEMs and Tier 1 suppliers, startups need to develop automotive know-how that’s different from other tech industries. “Find either an advisor or a full-time person from the automotive industry to gain the required DNA,” Adar advised.